The below artworks are the most important by Alfred Sisley - that both overview the major creative periods, and highlight the greatest achievements by the artist. Artwork description & Analysis: This monumental landscape was exhibited at the Salon of 1868. Avenue of Chestnut Trees Near La Celle-Saint-Cloud illustrates a hunting trail leading through a heavily shaded forest close to the village of La Celle. Sisley painted this subject two times before, in 1865. This painting's subject matter and intense color are reminiscent of the Barbizon school. In fact, the painting has been compared to Hobbema, Rousseau, Corot and Daubigny. Avenue of Chestnut Trees Near La Celle-Saint-Cloud is an example of Sisley's early work, which is known for the use of soft brushstrokes. His ability to represent the intense colors of the forest is achieved through the layering of green and gray tones. The deer standing to the right of the path may suggest a royal subject. Napoleon III owned this royal hunting ground, which led Scott Schaeffer to believe that this is why the Salon Jury of 1868 accepted the painting. Moreover, Schaeffer states that Sisley's intention may have shown contempt for a royal subject through its representation in a landscape painting, which was considered an "inferior" genre. While Sisley's later work does seem to represent the sobering affects of modernity on nature, it is unknown if Sisley took a political stance in this work. 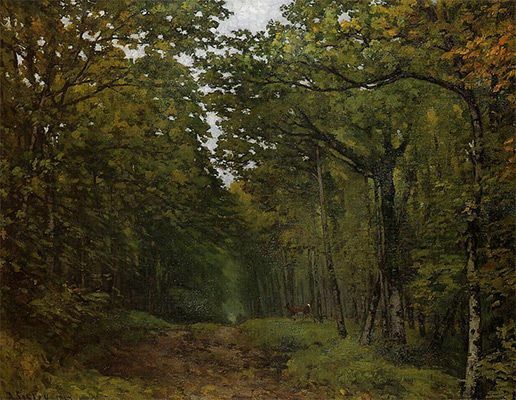 Avenue of Chestnut Trees Near La Celle-Saint-Cloud may have been Sisley's examination of new subject matter, as he worked outside of the confines of the Academy, pioneering the Impressionist movement. 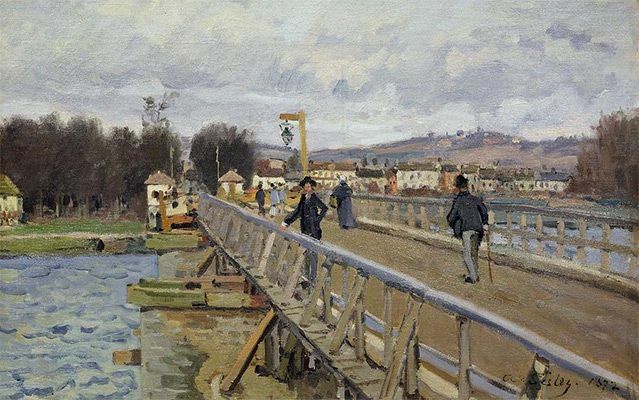 Artwork description & Analysis: Footbridge at Argenteuil (1872) is a landscape painting that captures modern life at the end of the 19th century. The subject matter is not typical of Sisley's oeuvre, yet the painting is stylistically representative of his work. Footbridge at Argenteuil is inspired by contemporary Japanese prints, in which, as here, the picture plane is the main focus of the composition. This is evident in the bridge, which dominates the canvas and flattens out the composition through the use of diagonal lines which evoke sharp, fast movement and thereby mimic the speed of modern day life. Additionally, the foreground is pushed forward and the canvas is cropped, which creates a similar sense of spontaneity of a photograph. The harmonious balance of muted dark and light colors allows the eye to move quickly across the canvas, giving the illusion of movement. Footbridge at Argenteuil is similar to Gustave Caillebotte's Pont de l'Europe, 1876. Although it is unknown if Caillebotte was aware of Sisley's painting, the two artists chose similar subject matter and viewpoints to depict the landscape. The two works differ in the way the artists chose to capture contemporary life. Caillebotte's painting focuses on the figures, celebrating modernity through the fashion of the period. In comparison, Sisley's painting focuses on the architecture, only showing a vague interest in the people strolling along the bridge. Sisley celebrates modernity, but through the detailed innovative materials of the bridge. Although there is a lack of obvious narrative, this painting is particularly informative about the context of the time. Footbridge at Argenteuil depicts the newly emerging middle class vacationing in the suburbs outside of Paris. This new access to leisure became more common with the development of industry and the newly constructed railroad along the Seine River. Impressionist artists began capturing this new subject matter, creating genres that were distinct from the limitations of the Academy. Artwork description & Analysis: The Bridge at Villeneuve-la-Garenne (1872) represents an Impressionist landscape along the Riverbank of the Seine. This painting is emblematic of Alfred Sisley's oeuvre, concentrating on the artist's perception of the natural world. The application of quick, feathery brushstrokes captures the ephemeral effects of light on a surface. This can be seen with the subtle nuances of color on the river that reflect the sky, clouds, and grassy knoll. 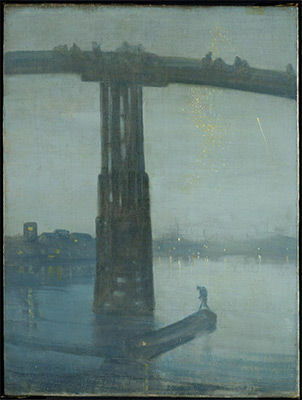 The perspective from which the artist chose to paint the bridge gives a sense of the structure's monumental scale. 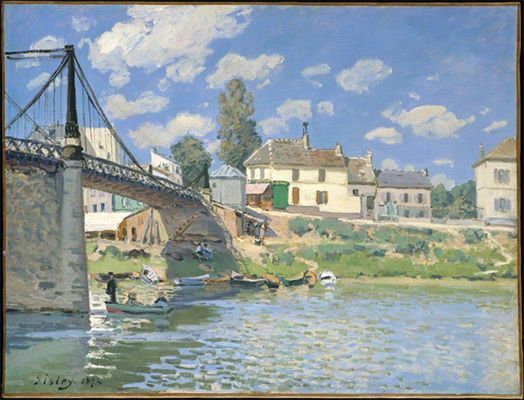 Additionally, Sisley included figures to provide a sense of scale to convey the bridge's size. While the Bridge at Villeneuve-la-Garenne is a study of nature, it also illustrates France's desire to be politically and industrially progressive following the loss of the Franco-Prussian war. The bridge was reconstructed after the war and represents the restoration of France at the end of the 19th century. The Bridge at Villeneuve-la-Garenne then represents the rhetoric of hope of regeneration. This painting was one of three works that Durand-Ruel purchased from Sisley. It was included in an album of three hundred of his most beautiful prints. The album was created with the intention to publish; yet this project was never realized. Artwork description & Analysis: The River Loing at Saint-Mammès (1885) represents a port where the Loing and Siene Rivers meet. Sisley painted this subject several times while living in Les Sablons. The painting's lack of shadows and intense, warm colors suggest that it is a summer afternoon. Sisley methodically breaks the canvas into four horizontal planes, the grassy knoll, the river, the beach, and the sky. He paints the grassy knoll with curving diagonal brushstrokes, which flows seamlessly into the river, distinguished by short horizontal brushstrokes. The flat cream color of the beach divides the sand from the river with long horizontal painterly lines. Sisley used the sky to create a harmonious balance of color, unifying the composition. The whites, reds, purples and blues making up the clouds are reflected into the water. Additionally, the red roof tops of the beachfront homes are reflected in the river. This color scheme is also employed in the boats and the Paris-Lyons railway viaduct in the distance. The deep hues, intense tones and systematic dabs of paint suggest that Sisley was aware of the Neo-Impressionist movement, particularly Seurat's method of pointillism. Indeed, there is an almost pointillist quality to this work. 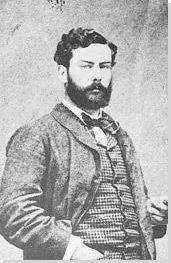 While Sisley's failing health and financial difficulties prevented him from traveling during this time, he may have taken short trips to Paris to see Seurat's paintings. 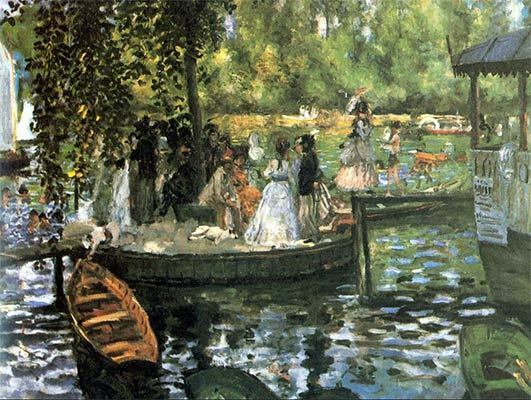 Although Sisley was one of the only Impressionist members to continue to illustrate the original philosophy of the Impressionist style, this painting suggests that he did experiment with other modern ideas. Artwork description & Analysis: This work represents an open field of grain outlined by poplar trees. The Four haystacks create a diagonal line through the canvas, giving depth to the composition as they recede into the background. The massive landscape includes a peasant working in the field to illustrate the monumental scale of the haystacks. Poplar trees frame the background, additionally emphasizing the vastness of nature. Sisley captures the light reflecting off of the grain with deep oranges and reds through the thick layering of paint. His brushstrokes are almost whimsical, giving the grain texture. Haystacks at Moret, Morning represents France as a fertile, agrarian country, bountiful in its resources. The poplars were a National symbol, often represented in the iconography of France. Sisley may have been inspired to explore this new theme after viewing Pissarro's The Rick, Pontoise (1873) and Harvest at Montfoucault (1876). 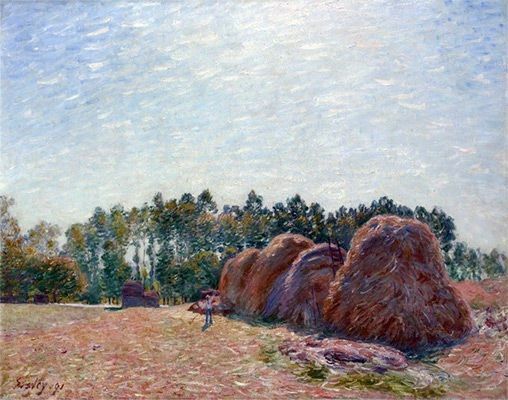 Additionally, he may have seen Monet's haystack series, exhibited at Durand-Ruel's gallery the same year he undertook this subject. Sisley returned to this theme in 1895, creating four more paintings of haystacks. Like Monet, Sisley used the poplars to illustrate the enduring qualities of nature. In this way, they answered the problem that the Impressionist artists faced during the last decade of the 19th century, how to take an ephemeral subject and make it timeless. Artwork description & Analysis: Sisley's painting represents the Church of Notre Dame at Moret-sur-Loing, seen from the West Portal entrance. 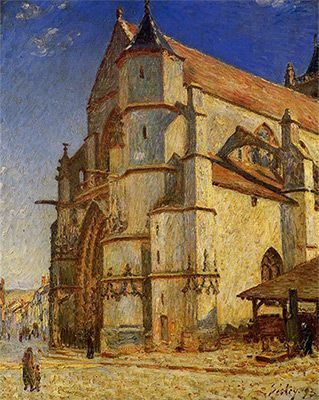 He painted this church about a dozen times after settling in Moret in 1889. It is considered a series, although it is unknown if it was meant to be exhibited that way. The architecture encompasses the entire canvas, translating the heaviness of the stone structure. Sisley emphasizes the solidness of the church with thick painterly horizontal lines, but his loose brushwork and ability to capture the quality of moving light and shadow lightens up the whole work. The painting represents the church during the late afternoon, when the sun was setting on the church. This makes for a glowing composition, with vibrant golds, oranges, and browns set off against a clear blue sky. 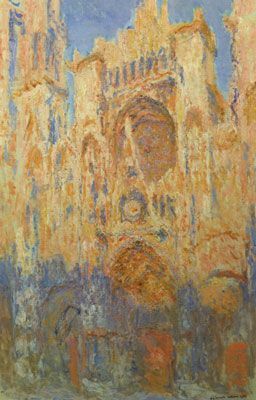 Church of Moret is quite similar to the paintings from Monet's Rouen Cathedral series (1890s), which show Rouen Cathedral at different times of day in different sorts of weather. 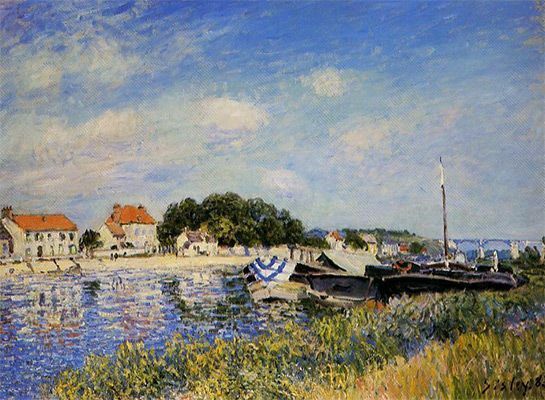 In spite of the similarity, it is unknown if Sisley was aware of or ever viewed Monet's series. In any case, it is a quintessential Impressionist painting in that it seeks to depict the real world around us in all its fleeting beauty and specificity.